Last month's Mondesi's House Survey unearthed the revelation that you want to see me cover more events in-person. Well, one day in the future, a Pittsburgh team is going to follow the lead of other big-time sports franchises and allow bloggers access to cover games in-person. 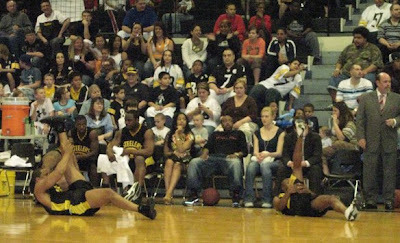 Until then, you'll have to settle for some random recaps of various Western Pennsylvania happenings, such as the MLB Fanfest, a Penguins practice, and the Steelers vs. Monessen HS faculty basketball game I attended last night. 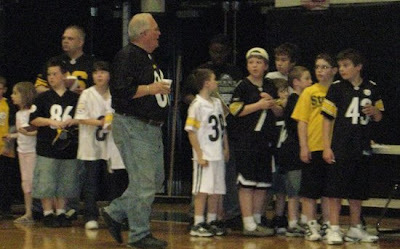 A lot of people give the Steelers grief, saying that they don't do enough for the community. While I've always disagreed with that line of thinking anyway, I had an up-close-and-personal experience last night, as I was literally sitting in the first row at midcourt. Sure, I paid $500 for the tickets from a scalper, but it was well worth it (actually, the tickets were a very reasonable $7, with all proceeds going towards the American Cancer Society's Relay for Life; I kid, I kid). 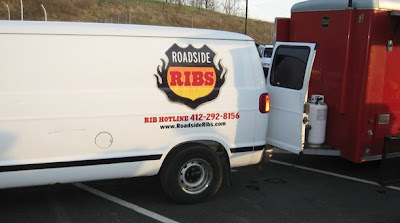 Roadside Ribs was set up with a barbecue in the parking lot, also to benefit charity. Unfortunately, I'd already eaten a gourmet dinner of tacos and more tacos, so there was no room to be had in my stomach. 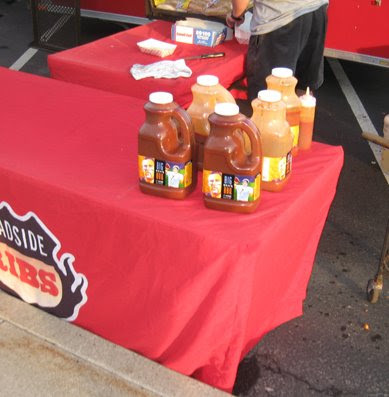 The barbecue sauce featured was...BIG BEN'S (what, you were expecting Open Pit?) 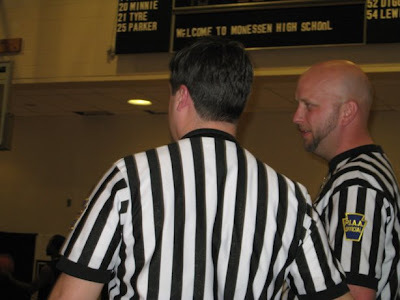 Referees included Monessen High legend Jeff Gagatko (left) and Mark Mizerak (right). 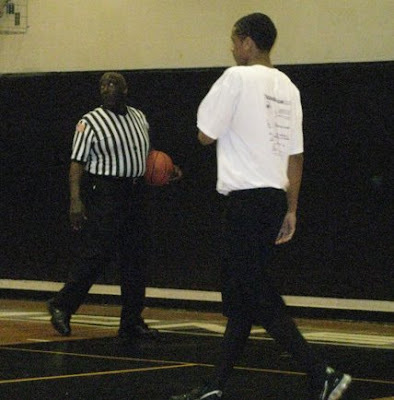 They officiated the game as if it were Game 7 of the NBA Finals, much to Najeh Davenport's dismay. Believe it or not, Davenport was actually called for a lane violation on a free throw. 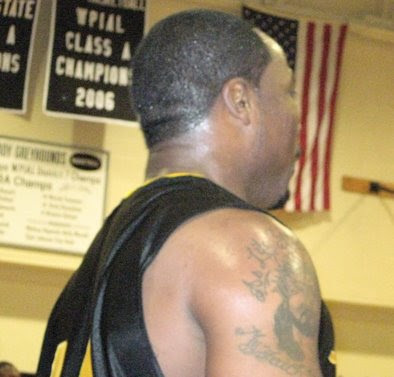 Monessen sported quite the deep roster, which included former Philadelphia Eagle Jamie Reader. The Steelers didn't do much warming up beyond the predictable stretches. That's Arnold Harrison on the left, showing his flexibility. By the way, they chose Jay-Z's Bring Em Out as their entrance song, if any of you care. It's point guard Anthony Madison, who will never be confused with Steve Nash after he literally dropped the ball and accidentally kicked it out of bounds on two early posessions. The Steelers brought six guys: RB Najeh Davenport, OL Max Starks, LB Arnold Harrison, CB Anthony Madison, and practice-squadders TE Jon Dekker (88) and WR Gerran Walker (21). Rumors of a Roethlisberger appearance turned out to be just that, although Large Ben did send an autographed football used as a raffle prize. Harrison steps to the line for two of his 18 points. How do I know he had 18 points? Because my dad kept a running total of the points scored at a Steeler charity game. What can I say? Nerdiness just runs in the family. After one quarter, it's Steelers 23, Monessen 11. What was the line on this one? We're at halftime, and the Steelers are cruising, 48-24. 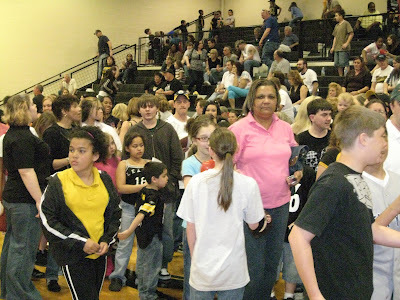 Autograph tables are set up around the gym for kids (and a few adults) to collect free autographs. Ever wonder what a guy who gets tendered for $7 million looks like up close? Bigger than you could ever imagine. I've never heard of Dekker before, but he was pretty quick on the floor and finished with 14 points. He has a definite love affair with the three-pointer. Unfortunately, he's behind the two-headed monster of Heath Miller and Matt Spaeth, so I don't expect to see much of him on the footbal field anytime soon. And to answer your next question, no, I don't know what that kid's going to do with a hat signed on the underside of the bill. The autograph line for Davenport and Harrison, or as I call it, "controlled chaos". "Yes, I will sign your back." "Yes, I will also sign your back." Davenport (right) was surprisingly charismatic and the definitive fan favorite by game's end. Harrison also had a great attitude, if I do say so myself. 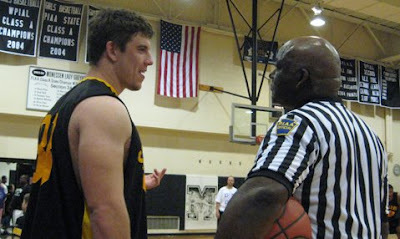 When you're going against 6'8", 337-pound Starks, there's bound to be a few size mismatches, as illustrated above. A close-up of Dekker about 5 inches from my seat. His elbow nearly hit my head on the inbounds. Back to the game: Monessen wins the third quarter by a 20-15 count and goes into the fourth down 63-44. It's going to take a miracle, but it helps when you have guys who run faster than the speed of light. In-between periods, the black and gold provided a nice photo op for some young Steeler fans. And we've got a game! 77-71 with just 23 seconds to go! The rally was kicked off when Monessen brought in secret weapon/prep star Josh Arnold (right), who I later found out might be a West Virginia Mountaineer in the near future. Arnold had four dunks down the stretch and looked every bit as smooth as his 32.8 PPG average would indicate. So as soon as Harrison found out that my dad was keeping score, he was constantly asking for updates on how many he had. While he didn't reach his goal of 20, his 18 were a game-high. Surprised by the tight score? I'm not. 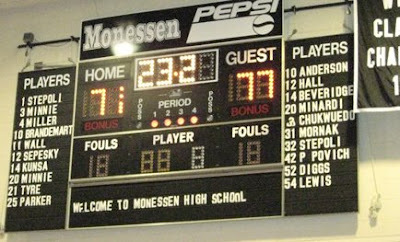 Monessen has a rich basketball tradition for both boys and girls. In fact, they actually have the top two girls' scorers in WPIAL history, Gina Naccarato (3364) and Charel Allen (3110), who was just chosen by the Sacramento Monarchs of the WNBA. 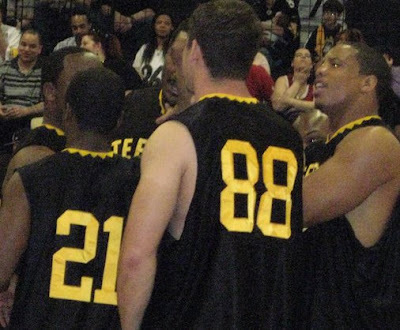 In true Steeler fashion, Najeh held the ball four the last few seconds, clinching a Steeler victory, 77-73. The totals: Harrison (18), Dekker (14), Starks (14), Walker (12), Madison (11) and Davenport (8). 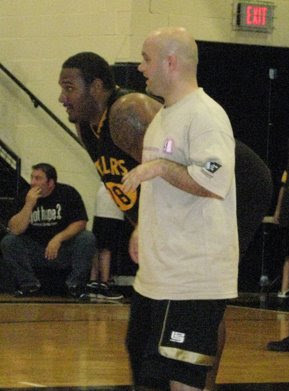 Luckily, I drafted Harrison in my Fantasy Steeler Charity Basketball League last week. Conclusions? For $7, you get entertainment, autographs, an up-close experience with some Steelers, and it's all in the name of charity. The players are relaxed and it's a fun environment. I'm dumbfounded by the fact that these games aren't better publicized, but in actuality you couldn't fit many more people into the gym. This experience gets high marks. 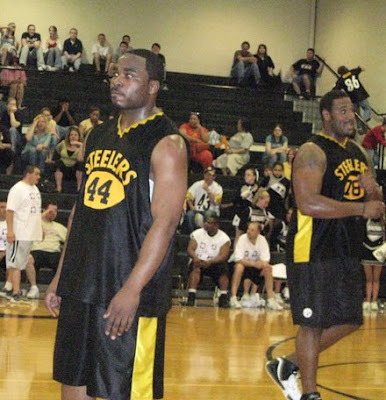 I don't have a schedule of upcoming games, but I do know that the Steelers will be appearing May 9 at Belle Vernon High School to benefit a scholarship in honor of three former Belle Vernon athletes between the ages of 22-28 who all passed away in the past five years. So hop in your car, take a trip to the Mon Valley, and enjoy the experience. Who knows? You might get to meet a certain Super Bowl Champion quarterback. Nice job Raul. Although, Bring 'Em Out is actually a TI song. Swizz Beats used a line from Jay-Z's "What More Can I Say" to make the hook for "Bring 'Em Out". Not unlike when Jay-Z used lines from Nas' "The World Is Mine" to create the hook from "Dead Presidents". Sorry, I am a rap nerd. And I am white, and from the suburbs. Sounds fun, but I remember reading about the Steelers actually sending players that were starters to those charity games once in awhile. 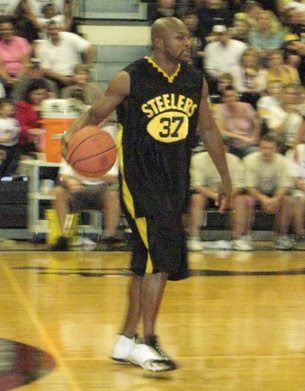 Ahhh, the annual Steeler basketball games. My only experience came when I was 5 or 6 yrs old and we saw the Steelers play at what would be my alma mater, Thomas Jefferson. I sill have a photo of myself with a curly-haired Mark Malone. I also remember Greg Banaszak being there for some reason. I don't even remember a lot of booing. 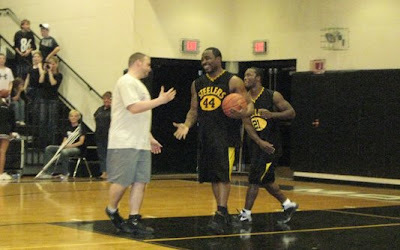 Nice piece on the Steeler's hoops team. I am a coach with the Thomas Jefferson Youth Football organization and we are playing the Steelers hoops team on Friday, May 2 at Thomas Jefferson High School. Proceeds are going to the Thomas Jefferson Youth Football Field Fund. Tickets are $7 and can be purchased at NovaCare Rehabiliation and Sports Performance at 275 Curry Hollow Road in Pleasant Hills (412- 650-8872 ask for Troy) or at Elliot's Back Street BBQ on route 51 in Jefferson Hills. Thank you for the space to place this. I have $100 that says Cherp can post up Max Starks. How long until one of the Steelers gets hurt in one of these games? 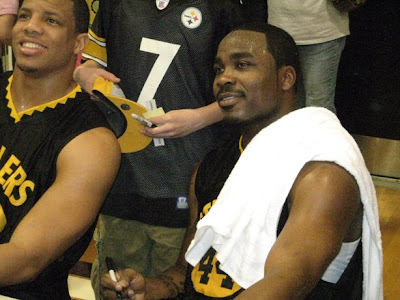 I can hear Jim Rome right now: "7 million dollar man Max Starks tore his ACL when he landed awkwardly after grabbing a rebound in a charity basketball game for the Steelers basketball team. The Rooney's are normally smart people, and I love the charity idea, but come on, why put your players at a risk for injury?!?" Max Starks (who played the entire game) was sucking severe wind midway through the third quarter. 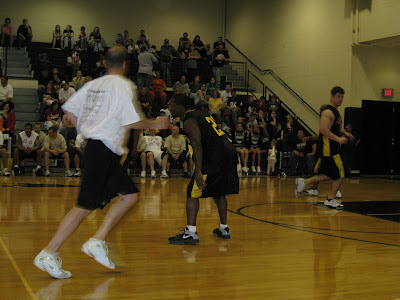 Of course the Monessen faculty was sucking wind midway through their second possession of the game! Starks was also noticed favoring his right ankle. If I was one of his ankles I'd be balking too. This guy has the biggest feet I've ever seen on a human being!!! Kudos to the Steelers for being involved in the community. These guys are athletes, they can't be treated like they're Tiffany Eggs. Sure, injuries can happen anywhere, but when you see a gym full of parents and more importantly, young kids, packed in APRIL to see their beloved Steelers, well it goes a long way to helping to explain why this team is so popular in this area and around the country. By the way, who was the athlete who got hurt playing in a charity beach volleyball game a few years ago?